I made a delicious baby kale and farro salad for lunch recently and had some leftover cooked farro to use up. 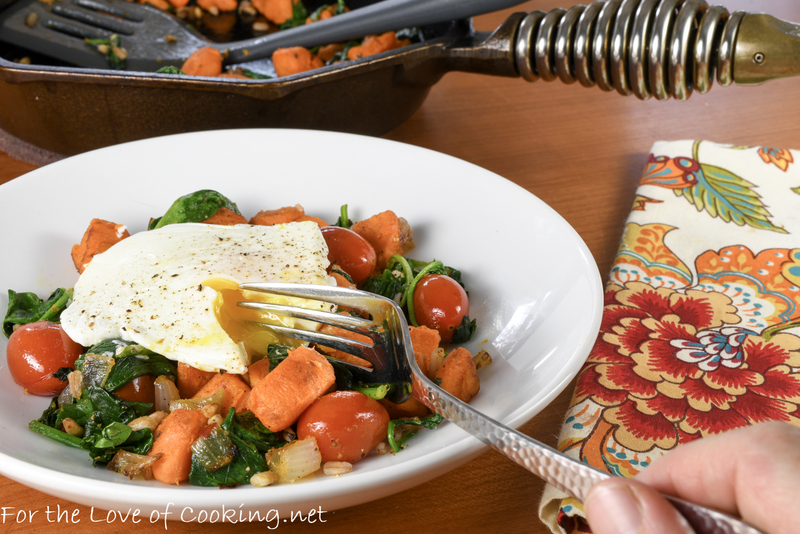 This morning, I decided to make a breakfast bowl with some sauteed sweet potato, shallot, spinach, tomatoes, and farro then topped it with a poached egg. Simple. Healthy. Delicious. I really loved the combination of flavors and textures and it was a very tasty and filling breakfast bowl. Place the diced sweet potato in a pot of salted boiling water over medium high heat. Cook for 8 minutes; drain. Place the drained sweet potatoes on a paper towel to remove any excess water. While the sweet potatoes are boiling, heat 1 ½ inches of water and 1 teaspoon of white vinegar in another medium sized saucepan and bring to a simmer. Heat the olive oil in a skillet over medium high heat. Add the sweet potatoes and cook, without stirring for 2 minutes. Toss with a spatula and add the shallot and tomatoes. Cook, stirring occasionally for 3-4 minutes. 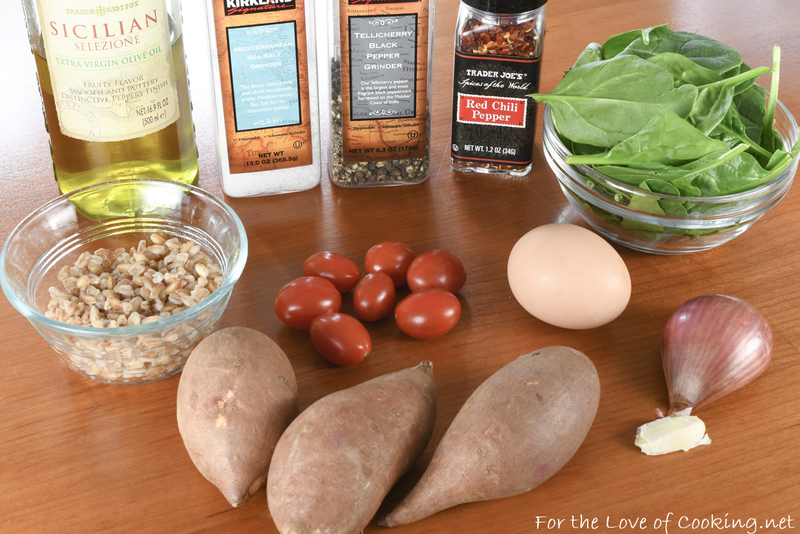 Add the spinach, farro, minced garlic, and crushed red pepper flakes then cook, stirring constantly, for 1 minute. Remove from the heat and season with sea salt and freshly cracked pepper, to taste. Remove from the heat. When the sweet potatoes and veggies are nearly finished sauteing, break 1 egg into a small ramekin. Once the medium saucepan of water is at a simmer, stir the water with the bottom of your slotted spoon clockwise to make a swirling motion in the water. Quickly and carefully slide egg into the water. Cover and turn stove off. Poach until whites are firm and yolks are still runny, 3 minutes and 45 seconds to 4 minutes. Remove the egg using a slotted spoon and drain a bit over the pan. 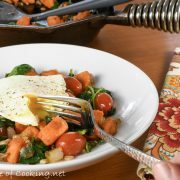 Serve the sweet potato and veggies in a bowl topped with the poached egg. Season the egg with sea salt and freshly cracked pepper, to taste. Serve immediately. Enjoy!!! Place the diced sweet potato in a pot of salted boiling water over medium high heat. Cook for 8 minutes; drain. Place the drained sweet potatoes on a paper towel to remove any excess water. Add the sweet potatoes and cook, without stirring for 2 minutes. Toss with a spatula and add the shallot and tomatoes. Cook, stirring occasionally for 3-4 minutes. Add the spinach, minced garlic, and crushed red pepper flakes then cook, stirring constantly, for 1 minute. Remove from the heat and season with sea salt and freshly cracked pepper, to taste. When the sweet potatoes and veggies are nearly finished sauteing, break 1 egg into a small ramekin. Once the medium saucepan of water is at a simmer, stir the water with the bottom of your slotted spoon clockwise to make a swirling motion in the water. Quickly and carefully slide egg into the water. Cover and turn stove off. Poach until whites are firm and yolks are still runny, 3 minutes and 45 seconds to 4 minutes. Remove the egg using a slotted spoon and drain a bit over the pan. 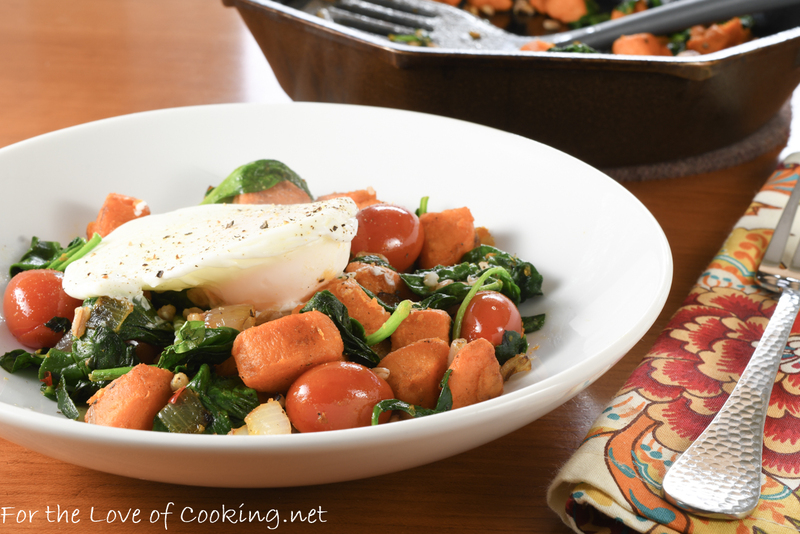 Serve the sweet potato and veggies in a bowl topped with the poached egg. Season the egg with sea salt and freshly cracked pepper, to taste. This is great for any meal! Off to the supermarket to get some sweet potatoes too. So glad to see farro in your recipes. a great Italian grain. Adding the poached egg is brilliant. Looks so good. this looks delicious, fun flavors and so healthy. Of course, the best way to make a dish better is to put an egg on it! !